The Baronnies mountains are the westernmost extremity of the French Pre-Alps – and so a strategically important site for the establishment of a corridor for bearded vultures between the Alps (where the species has been reintroduced), the Grands Causses-Massif Central (where there is also a reintroduction project) and the Pyrenean populations. This is indeed the ultimate aim of LIFE GYPCONNECT, that seeks to establish a breeding population of bearded vultures in the Massif Central, as well as in the Pre-Alps, through reintroduction, and promoting dispersal movements. 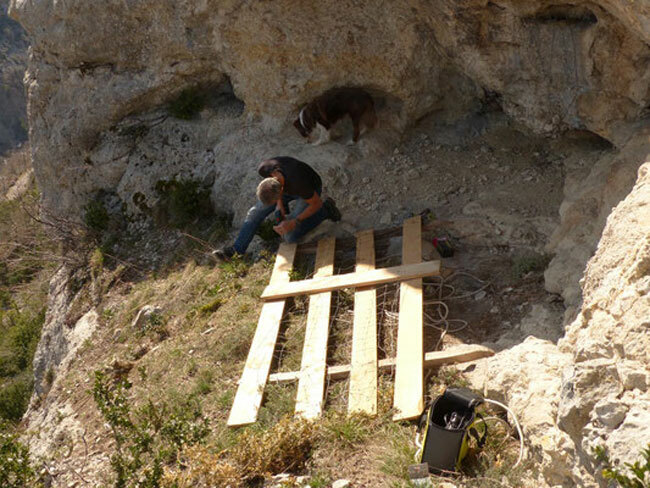 Later this year we will be releasing young bearded vultures in the Grands Causses, but also in Baronnies, for the first time ever – and the project teams are busy preparing for those seminal moments. A hacking platform has already been selected, and now all the preparations – including the necessary fencing, are being erected. Our partners Vautours en Baronnies and ERDF are also doing some work to correct a potentially dangerous electrical line that traverses the valley below the hacking platform. 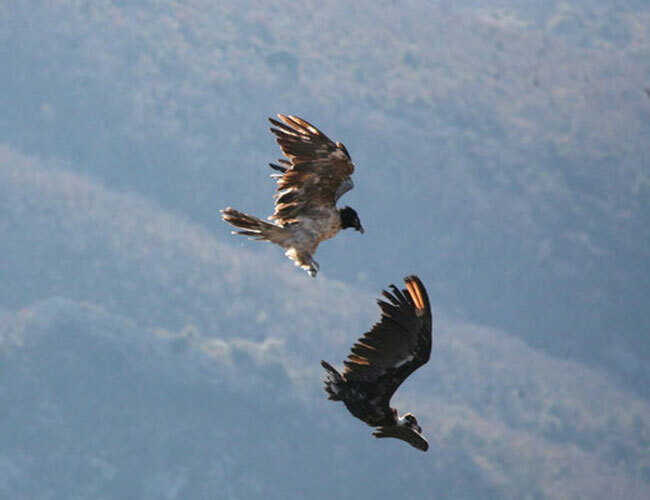 In the meantime, Gerlinde – a bearded vulture released at nearby Vercors in 2013 but that has now taken up residence in Baronnies, has been playing up with the local black vultures (see photo above). The LIFE+ project GYPCONECT is led by the League pour la Protection des Oiseaux (LPO), in partnership with the VCF, Vautours en Baronnies, Centre National d’ Informations Toxicologiques Vétérinaires, Electricité Réseau Distribution France, Parc National des Cévennes, Parc Naturel Régional du Vercors, and the Université Pierre et Marie Curie – Paris 6.